Philip Hammond has warned the EU the UK will "go it alone" and build a new satellite navigation system if shut out of the Galileo project after Brexit. The chancellor said the UK wanted to remain a "core member" of the EU-wide scheme, which it has helped pay for. But if this was not possible, he said the UK would develop a rival scheme as access to the data satellites provided was vital for national security. The issue has become an emerging dividing line in the Brexit talks. The UK has demanded £1bn back from the EU if the bloc carries through on its plan to exclude Britain from Galileo, which was developed by the European Commission and the European Space Agency. Brussels has cited legal issues about sharing sensitive information with a non-member state - but the UK has said the row could harm wider post-Brexit security co-operation and "risks being interpreted as a lack of trust in the United Kingdom". Arriving for a meeting of European finance ministers on Friday, Mr Hammond - regarded as the cabinet's chief advocate of the closest possible links with the EU after Brexit - issued a stark warning. "We need access to a satellite system of this kind, our plan has always been to work as a core member of the Galileo project, contributing financially and technical to the project," he said. "If that proves impossible then Britain will have to go alone, possibly with partners outside Europe and the US to build a third, competing system. But for national security strategic reasons, we need access to a system and we'll ensure that we get it." There is nothing like a common enemy to unite a divided group. The EU's threat to freeze the UK out of its satellite navigation system has riled both Brexiteers and Remainers at the very top of government. Philip Hammond, one of the most Brexit-sceptic figures in the cabinet, has talked of the UK "going it alone" with its own rival project. In stark contrast, just the day before he'd spoken of "shared challenges" and "unshakeable commitments" between the UK and the EU. If the line from Brussels that the UK is chasing a "fantasy" was designed to anger the other side it appears, at least in part, to have worked. But it may also have helped galvanise UK officials' resolve to negotiate hard with the full backing of the cabinet. Britain's aim of turning Galileo into a shared post-Brexit project is "a big ask" according to the EU, but that is different to saying it cannot or will not happen. So it may also be the case that the government senses this is a fight it can win, and is upping the ante accordingly. Labour seized on Mr Hammond's comments, suggesting they showed the government was willing to spend "billions of pounds" on an alternative space programme at a time of continuing austerity in public services. "It's time the chancellor came down to Earth to prove he is on the same planet as the rest of us," said the shadow chancellor John McDonnell. Amid growing tensions over post-Brexit security co-operation, a senior EU official on Thursday attacked the UK's "fantasy" approach to negotiations which they described as "let's just keep everything we have now". 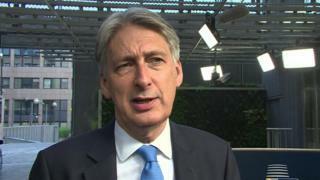 Mr Hammond said such comments were "not particularly helpful" given the clock was ticking down to the UK's March 2019 exit and both sides needed to make significant progress by the next month's summit of European leaders. "There are obviously a wide range of views on both sides but everybody that I've engaged with has been very constructive and very keen to find a way to move forward," he said. The UK, which has one of Europe's largest military budgets and most sophisticated intelligence operations, has said it wants a separate defence and security treaty with the EU to enshrine existing co-operation. On Friday, the UK published a paper making clear that agreement on the exchange of classified information was essential for future co-operation in a range of areas, such as common EU security and defence operations. Among "ongoing commitments" that could be put in doubt include Operation Sophia, the Italian-led naval mission combating illegal migration in the Mediterranean which is being assisted by the Royal Navy and Operation Althea, a peacekeeping mission which upholds the 1995 Dayton Agreement in Bosnia-Herzegovina. "Without access to documents of this kind, the UK would not be able to manage the risk of deployments and would not be able to commit personnel or assets," the document says. The UK says it is in both sides' interest for it to maintain its "significant" role within the EU's Intelligence and Situation Centre and also points out that the UK's National Cyber Security Centre regularly shares intelligence with EU partners and helps attribute major attacks across the continent. The UK wants a similar agreement to those the EU has with the US and Canada but says "existing networks" should be used to ensure no interruption in co-operation and that different security protocols should apply depending on how widely information is disseminated.